Very nice, so this picture you just took and uploaded, while other pictures are from past trips right? Yes. I take photos and I like to travel... But in the past, I couldn't share them. Now, thanks to the web (and thank you Caedes), I can propose my pictures and can discover yours. Nice. I like the sky..
aahhh you took it on the ferry no? I took the same ride in the same waters at roughly the same time (night) it brings back memories. Or, to see all sides of it, go to the discussion "war on iraq" in the message board, and make your own decision. Nice Pic! I was in Paris before, and never saw it so nice even with my own eyes!!! Yes it is I am a french ROFL!!! how are u???? I try to scan old paper shoots or upload numeric one but yet I did not understood all for the correct size LOL. Just back and going to try again. I am living in Belgium. well done i love it :) night shots can be so beautiful! In midst of nothing, something is. So I ask, "What is this?" Answers come from all around. And I hear, without a sound. the cathedral really adds life to the picture... gnarly man! Awesome!! I don't know how I missed this one before, this is the first image I have ever given a "10". Makes me feel like I am truly there. Makes me want to go visit Paris, and I don't even like wine and cheese! Thanks Piner! Wine and cheese are french, but Paris is Paris: a wonderfull city! Superb lighting, contrast and composition. Looks like you were floating above the river. I just got back from Paris. I wanted to take a picture of the Notre Dame too, but they're restoring it right now, so my pictures are kinda spoiled by the scaffolding around the tower. Into the favorites it goes! Breathtaking! I've always wanted to go to Paris. Nice subject. A city looks alive at night. Paris at night. A lovers dream. Beautiful photo. words dont do it justice but i still have to say beautiful. So beautiful! I was just in Paris last week and this picture brings it vividly back to mind. That is so beautiful! i want to go there now take my g/f, thank you for sharing! well captured! They were restoring the cathedral when I was there, nice to see it without the scaffolding. I took a bateau-mouche, and I'd recommend that to anyone who visits. 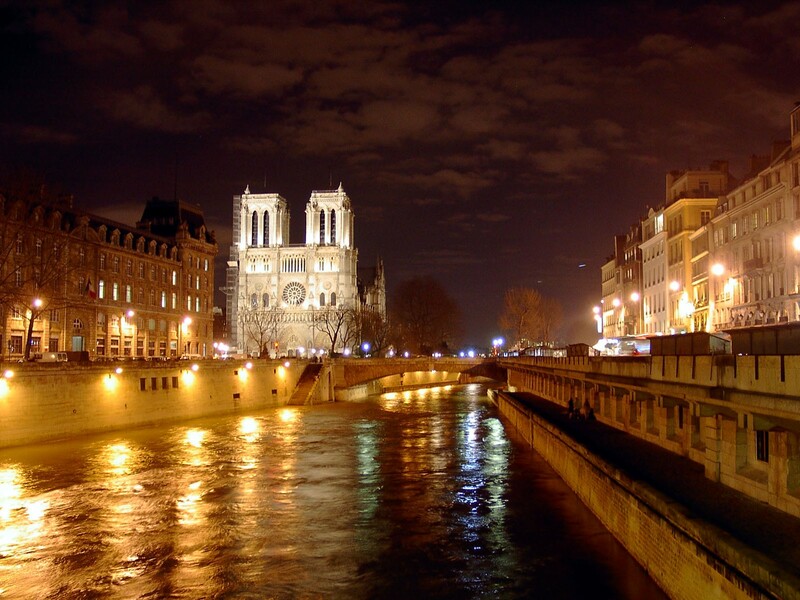 A tour down the Seine is something you can't leave Paris without doing. "the road of life is full of bumps... some are bigger bumps than others......."
Hi! I just love this image!! I have been in Paris 2 times in my life..last time 2 years ago..
" If you have nothing to hide, You hide nothing"
I love the reflection of the lights. Looks like a cool place. When the rooster crows, it's time to WAKE UP! Lovely pic, perfect exposure, and good angle. Beautiful, it really makes me want to be there, you know. I love the lights and the colours good job!! I've been to Paris and this picture is the first I've seen that's really captured it. Absolutely amazing. It is so beautiful, i want to go to Paris so bad! I am a City Girl in a Country World! I've been in Paris Two times in my life. This is one of my favourite images of you! The "Golden touch" and the uplighted Notre Dame is just amazing in this wonderful image! 10 points without a doubt! Great Pierre!
" Today Is That Tomorrow We Worried About Yesterday"
It is soooo pretty! My older sister is going to take me to Paris when she goes! I can NOT wait!!! I wonder what it would look like if you used a longer exposure to blur the water. That might add a timeless feel and contrast the lighting. Just a suggestion to an already seemingly pro shot. Very Nice! Well, ive seen so many pictures of Paris, each wanting to make me visit France even more. A wonderful capture Pierre, of arguably, Europe's most romantic and beautiful city and I agree that you always think of Quasimodo as you walk towards Notre-Dame. The illumination along the embankment of the Seine, reflected by the water, and the great lighting of the majestic Cathedral are superbly caught in this image which brings back happy memories for me! In answer to your question Pierre, yes I have been to Paris and find it to be a wonderful city of beauty and vibrancy, my favourite city without doubt! This is still one of my favorite images on caedes mon ami.I hope one day to see the city you have captured so well!! This is a very good night capture. I like the "magnificence" (glowing) of the Notre Dame. I visited Paris this year, 2005, in the summer and realy enjoyed the beautiful French city. Pierre - I am impressed with the crisp detail in this limited light photo. Was it film or digital? Either way, it is very difficult to achieve crisp subject and compressed lighting in a low light enviroement. Excellent photo. Do more please. P.S. by the way I was born in Geink, are you anywhere close to there? This photo speaks for itself! I'm honored to view all your photography! what an awesome view of the Seine and Notre Dame. Both are inspiring by themselves, but you've truly captured beauty at its finest here. Excellent photograph, thanks for sharing it! A beautiful shot, I just did Paris as a project in French class. All of which makes me anxious at times unbearably so Freedom Forever! Check this out! this makes me want to go back there!! i love this picture!! I really love this image. it really makes a great wallpaper. C'est la Siene! Super! J'adore Paris. Tres, tres belle, aussi. It's the Siene [river!] I love Paris. Very, very beautiful, also. So beautiful it could a classic shot: well done! This is such a pretty place!! The shot is fantastic!! This is GOLDEN....really. I love the gold cast of light and the shot is just perfect. Stunning, sharp, majestic.